“One slap nearly drove away all my curiosity.” Looking back to a trauma in his childhood 60 years ago, Ko Hung-tu can’t help but grin wryly. Ko, who had not long entered primary school, suddenly got the idea to spread flour paste all over a painting he had just done in art class, thinking it would produce a moist glossiness. But before the paste had dried, the teacher came round to collect the children’s work. The wet paste made his fingers sticky, and he was so angry he slapped Ko in the face. Ko’s creative expressiveness, which was only just beginning to develop, was knocked back to square one. After that he only dared to follow the rules, repressing his bold and imaginative desire to explore. Although Fate had closed one window, it also arranged for the appearance of an angel, who guided Ko in shedding his fetters and flying freely. In his third year in primary school, he met the first great benefactor in his life: art teacher Yang Jia­lin. Ko, who had never thought of himself as having artistic talent, was regarded as a genius by his teacher. Through Yang’s careful cultivation, that aesthetic seed that had nearly been snuffed out was once again able to germinate and grow. 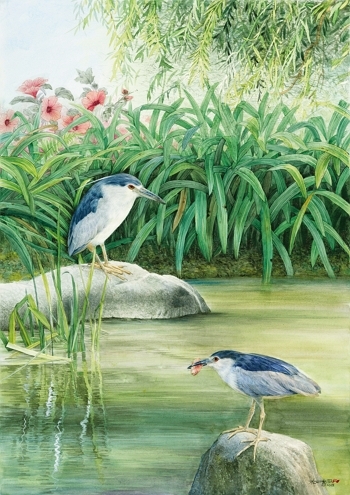 Ko used black-crowned night herons to express the concept of peaceful calm. Shown here is a watercolor entitled Tranquility. “I was plucked out of a sea of 3000 people.” When Ko completed his military service, a Japanese company happened to be recruiting textile pattern designers. Despite having studied veterinary medicine in vocational high school, he successfully made it through several rounds of testing and was taken on. 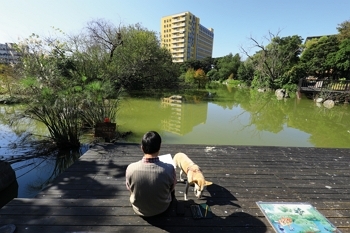 “I am really grateful for the strict training I underwent during this period, as it gave me a strong foundation in drawing.” The company arranged for all 20 new incoming employees to go into the countryside to sketch from nature once a month, and Ko took to this exercise like a fish to water. Not only did he become good at rapid sketching, he also learned to get design ideas from local themes and materials. He has carried forth this habit of imitating nature to this day. Throughout his career, Ko has used design to express his love for Taiwan. Thanks to an introduction from Apex Lin, later vice-president of National Taiwan Normal University, in 1991 Ko began working for the first time with Taiwan’s post office (now the Chung­hwa Post Company). 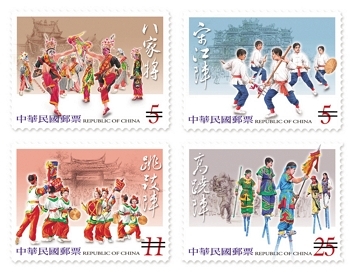 In this collaboration, which still continues today, Ko has designed more than 80 sets of stamps with themes based on the natural environment or traditional culture. This is unprecedented in terms of both the number of sets and the length of the collaboration. “Stamps are like the country’s calling cards, so they have to express Taiwan’s beauty.” The foundation of experience laid down over more than 20 years has shaped Ko’s classic vocabulary and style. Ko’s career also includes time with Taiwan’s top two paper manufacturers: ­Cheng ­Loong and Yuen ­Foong Yu. He joined Yuen ­Foong Yu in 1989, and four years later was made general manager and creative director of Champion Corporation, where he was responsible for developing paper manufactured products and ­shaping the company’s image. During his 11 years there, Ko ­introduced themes of local culture and nature into the design of re­cycled paper products, and the company’s reputation grew rapidly. Media personality Grace Chen has said that in her mind the “cultural heritage gift boxes” produced by Champion are first-rate products. To put it simply, beauty is a language that everyone understands. Not only has Ko won the National Graphic Design Award, the Innovative Commercial Design Excellence Award, and the China Times Advertising Award, he has also been selected for participation in poster competitions in the Czech Republic, France, Mexico, Japan, and elsewhere, and for graphic design awards in Korea and Hong Kong, as well as for the World Star Packaging Award. He has really become the pride of Taiwan. Ko, with his artless and earnest downhome character, is not given to self-serving trickery or cutting corners, but can only put his head down and naively work away. “Fate has given me this skill, so I have to live up to it!” It is this kind of perseverance that has underlain the creation of Ko’s painting series “Endemic Birds of Taiwan,” his poster, illustration, and stamp series “Cetaceans of Taiwan,” and his current meticulously detailed water­colors. (top) Harvest Season. (above) Spreading Fragrance of Osmanthus. Still waters run deep, and beneath his simple exterior, Ko Hung-tu has the desire to overturn tradition. This courage to break free from established frameworks erupted in the series of poster designs that made up his graduation project at NTNU’s Graduate Institute of Fine Arts 12 years ago, entitled “Taiwan Society Erotica.” He used flowers and artistic symbolism to bring this veiled social topic out into the open in an exquisite and refined way. Ko, who has a talent for using images to tell stories, borrows the flourishing and decay of nature to express himself. In his series on maintaining spiritual health, the poster The Prematurely Withered Flowerwas a metaphor for the sharp pain behind brightness and vitality. Only by learning to read the depression and frustration that underlies the aesthetic surface can one understand life’s sorrows, including the pain of seeing dreams frustrated before they come to fruition. With its transcendent beauty, this red lotus flower amidst the intense green of the plant’s leaves cuts a gorgeous figure as it sways in the wind. 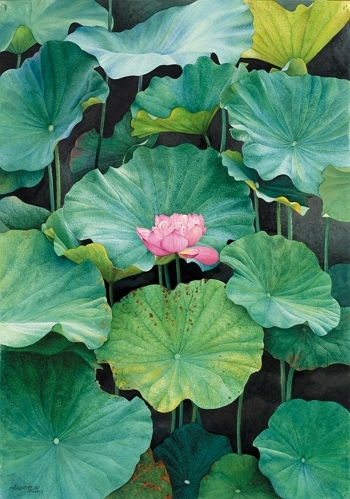 The photo shows a watercolor painting entitled Standing Out from the Crowd. Over the years, Ko’s deep compassion has allowed him to gradually set aside conflicts, and as a result he is even more open-minded and tolerant. Ko, who has long devoted himself unselfishly to helping stray animals, has taken every expression of pets and portrayed them on paper. 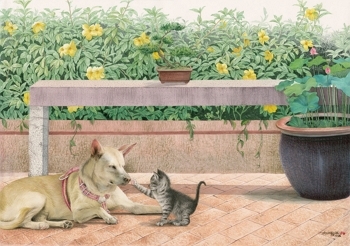 “All of the dogs and cats in my home were strays.” Ko, who every night for the last 15 years has been going out to feed stray animals, says; “There is resonance between myself and strays.” In his poster Thirst for Love, which expresses the plight of stray animals, Ko contrasts frail loneliness with lavish indulgence. In Scars of Inequality, a shocking image of an animal with flesh lacerated by beatings is set against the happiness of a healthy animal with luxuriant fur, stunning the viewer with a contrast between heaven and hell. Ko uses a gentle painting style to teach people that all living things are equal. “My life has been full of rich variety.” It was only after having roamed the world of applied arts for half a century that Ko came to the realization that everything he did was done in order to return to a childhood dream. The applied arts are a very broad field, but in his work across so many different media one thing never changed, and that was his effort to manifest his deep concern and love for this land where he was born and raised. With his habitually bloodshot eyes close up to the paper, Ko holds his breath as he focuses on his work. Using a brush as fine as hair, he paints stroke after stroke of watercolor with his forearm suspended steadily in the air. In his meticulous works he reproduces ­every tiny detail of living things, creating vivid and lifelike scenes of nature. 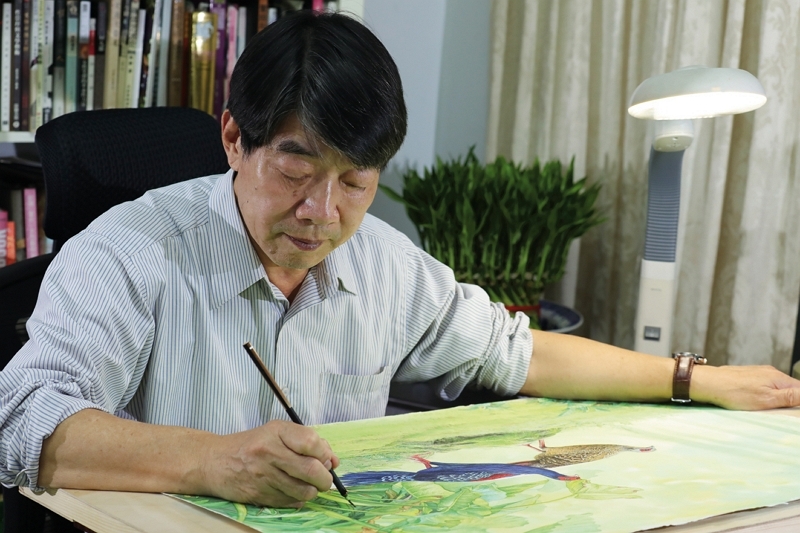 Chen Shih-lun, head of the College of Innovation and Design at Chih­lee University of Technology, praises Ko for the innovations he has brought to the world of Chinese nature painting. 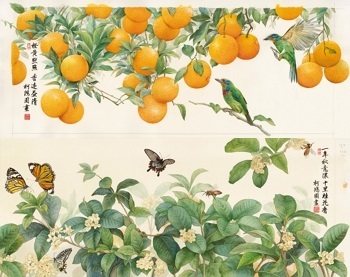 Lo Cheng-­hsien, a famous master of traditional Chinese painting and formerly head of the Fine Art College at National Taiwan University of Arts, has expressed his admiration for Ko’s perfect matching of Western and Chinese painting, deftly integrating essential elements of traditional Chinese painting into Western watercolors in a way that feels refreshing and unique. “The camera is another brush for me.” Capturing all living things from nature on film, he gathers these into his inspiration database, constructing a spiritual haven. “Although they are realistic, in fact the pictures are all carefully composed.” Only by integrating aesthetics and creative concepts into the utopian world the painter creates in his mind can one achieve meaning and depth. “The task that Fate has given me is to continually learn and continually create.” From paintings of flowers, birds, and insects in the series “Taiwan—Nature of the Twelve Months” to rural cats and dogs painted in the style of the famous scroll painting Along the River During the Qingming Festival, Ko uses beautiful brushwork to capture the beauty and vitality of each and every creature in life. Tai-Hwa Pottery reprinted his bird and flower series on porcelain cups, transforming these sublime works into three-dimensional artifacts. And the Taiwan Tobacco and Liquor Corporation turned his paintings, with their richly Taiwanese flavor, into images for the packaging of a new whiskey product. “The things I have been able to achieve in this life have flabbergasted my whole family.” For Ko Hung-tu, who says that life begins at 70, new artistic buds are still opening.